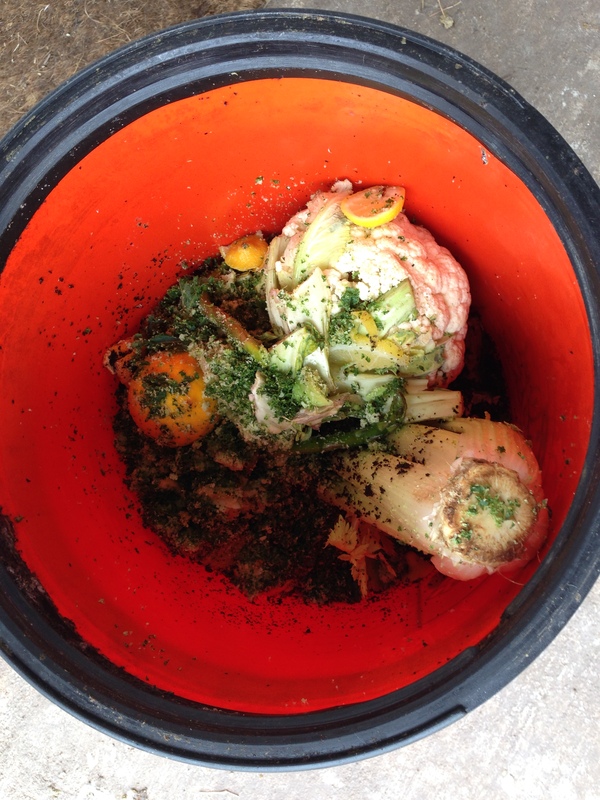 Every other day we collect enough food scraps to feed the chickens and turkeys. This includes Veggies, fruits, Breads, leftover sandwiches from my kids’ lunchboxes, rice, leftover dinner scraps, etc. I try to keep onions and garlic out, but I cook with these two a lot and so far I don’t taste a difference in the eggs. Either way, when I walk outside and there is no sign of my flock, i use my “turk turk” call 🙂 and they come running/flying over. I love it! They make sweet noises and follow me to the compost bin we built for them. I try to remember to keep my dogs inside so they don’t bully the chickens and turkeys out of the scraps. Here is a video I took today doing this part of my chores:) Enjoy! Food Scraps for my flock! We do a veggie juice for lunch so the pulp from the juicer goes in here too. My babies get lots of vitamins on a daily basis, ensuring the rich yolk that we love!